Winter is here! PROTECT YOURSELF! I decided to post this because I saw a story on the news last night about a small local church that had a CO leak and 4 people that suffered carbon monoxide poisoning. I have had this experience personally, and it is terribly scary to realize how easily my entire family could have perished. Especially when you consider how simple it is to avoid this type of tragedy. It happened about 4 years ago. I had been suffering from migraines already, and of course flu and allergies cause their share of illness. One night in particular, I awoke around 2a and felt nauseous. I went to the bathroom and threw up, then went back to bed. Two hours later I awoke and did it again. And again. I called in sick to work and slept for a good part of the day, thinking it was a 24 hour flu. About a week later it happened again, all night long. That weekend was my daughter’s birthday party, and by the time that afternoon came round I had to call a friend to come help because I felt so weak and ill I couldn’t stay awake and upright to host her party. I knew something was wrong at that point. I really felt just terribly weak, with a headache and nausea, but it wasn’t constant. It was sporadic. My concern was really raised when my daughters slept with me one night and it happened again. My older daughter woke me up during the night and told me she felt like she was going to vomit. This memory haunts me still. I told her to get up and go throw up then. I couldn’t move. I couldn’t even think of getting up to help her. That is so far out of my character I knew something was really wrong. I told a friend of mine about what was happening and he suggested that it might be carbon monoxide poisoning. I realized that we had just begun turning on the heater, so that could account for the sporadic nature of the issue. I immediately called someone out to check the heating units. The unit over the bedroom had a leak. The technician warned me not to turn on that unit and that he had to call someone in for a second opinion (I had a homeowners appliance insurance policy of some sort, so they required it to cover the costs). The second tech came out two days later. By then we were pretty cold, sleeping each night in a huddle in front of the gas fireplace to keep warm. This tech checked for leaks without turning on the heat, after telling me his tester didn’t seem to be working properly. Then my home insurance people told me there was no problem because the second tech found no issue. I was livid. Momma bear came out and I let them have it over the phone, insisting with reps and managers that I required another tech to come out and do a proper check with proper equipment. The first tech came back out with more sophisticated intruments, turned on the heat and tested for CO. And still found a leak. 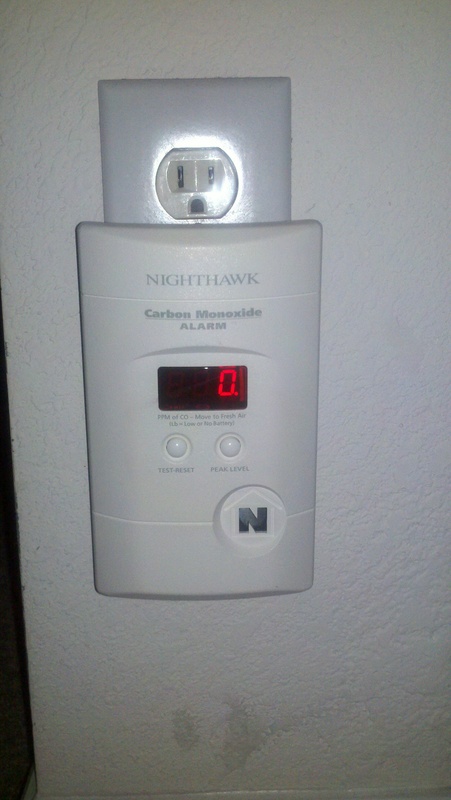 A few days later the unit was replaced and we could safely heat the house again. Since that event, I purchased 2 CO detection units. These models, with the LED readout cost about $30 each. You can find them more or less expensive at almost any local store (Target, Walmart, Lowe’s). AND THEY ARE WORTH IT! More worth it (in my opinion) than smoke detectors. CO cannot be smelled. It cannot be seen. You come down with flu-like symptoms and headaches, and then if you are not as lucky as my family was, you die. I thank God for the fact that my daughters were both sleeping with me that night, as Amy usually slept on her top bunk and may not have made it through the night if she had been up there. PLEASE PLEASE PLEASE consider getting one of these units. It’s a small one-time cost that truly could save your life! It doesn’t just happen to other people, it could happen to YOU!